Claire and the family left for school early and I had a leisurely start. 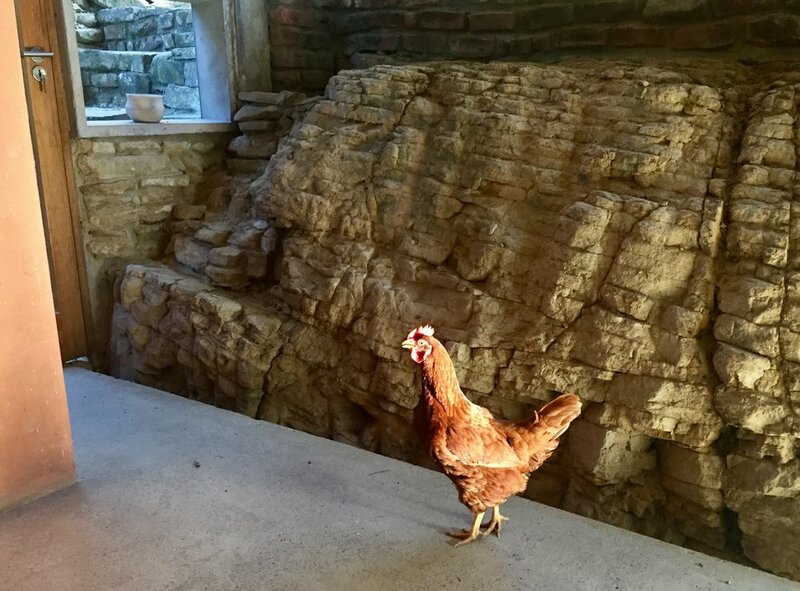 Great excitement and loud clucking noises as one of the chickens snuck inside and went downstairs to lay an egg on the wall in the ground floor corridor and then needed to be let out. She was very insistent until I let her out! Then I started researching African stone tools. The indigenous people here were Khoi San hunter-gatherers, who were later displaced by the Bantu people from Western Africa. The remnant of the stone-scraper that George found on site shows the typical triangular knapping pattern that is typical of stone tools in this area. A collection of local tool finds showing the typical triangular knapping pattern. There are archeological remains in the nearby dunes, also half-buried middens of shellfish and pottery shards left by wandering groups of people over 120,000 years ago to almost present day. 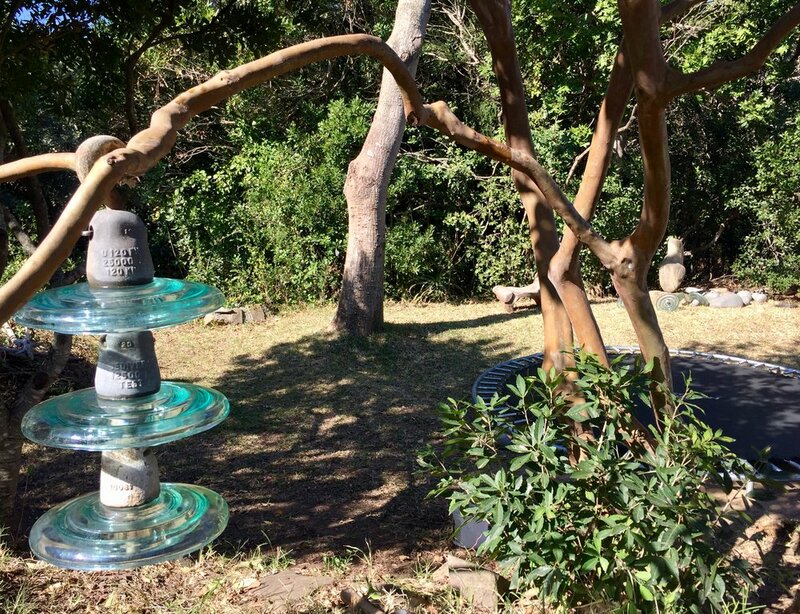 George dug the trench for the suikinkitsu overflow- a mammoth feat of shovel work and I washed a set of three 'found' glass electricity insulators which will hang off the guava tree as a gateway feature and bell/chime for the labyrinth. A low growing Guava tree branch forms a low gateway to the labyrinth. The divining rods confirmed the position of its centre and the number and position of the steps up the bank. After lunch I researched Guava Leaf Tea- which is a very good source of vitamin C and then various types of labyrinth on line; we know it has to be 3 metres in diameter so that fixes the number of circuits. Tomorrow I will start setting it out; it will probably be made of black basalt and limestone beach pebbles and have a well or reservoir at its centre. The weather was warmer today but it's turned very cold and windy again tonight. I watched Buttons, the dog, make his bed; he's very particular and drags it around and pummels it to make sure it's cosy and comfortable before settling down for the night.